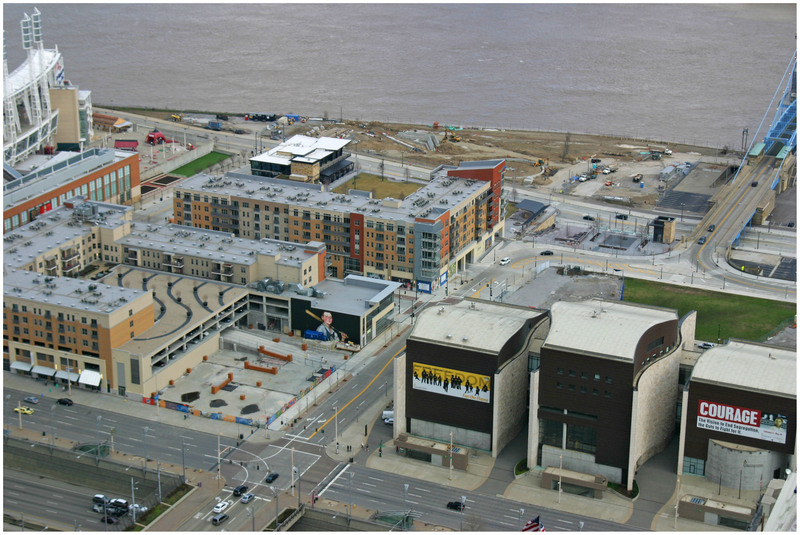 The Banks development team announced today that Yard House, an upscale American fusion restaurant with 100-250 taps, will open its first location in Ohio on Cincinnati’s central riverfront. The 10,000-square-foot restaurant will be the first stand-alone commercial tenant at The Banks, and will be located immediately in front of the National Underground Railroad Freedom Center at the corner of Walnut Street and Freedom Way. Project officials say that the new structure will have an urban, industrial design featuring an open floor plan, exposed pipes, warm moods and stainless steel accents. The Banks development has exceeded expectations in its first phase of development, and may soon break ground on phase two. Photograph by Randy A. Simes for UrbanCincy. The restaurant was originally started along Los Angeles’ famed Long Beach waterfront nearly 16 years ago and has since spread across the United States to 38 select cities. In addition to this being Yard House’s first location in Ohio, it will become only their second Midwestern location with the other being located in Chicago. The location is one of two buildable sites in front of the NURFC intended for restaurants, and will be located across from Ruth’s Chris Steakhouse which is currently under construction. With phase one of development almost entirely occupied, speculation will now turn to when the second phase of construction will get underway. Cincinnati Mayor Mallory has already hinted that groundbreaking could take place this summer. Next articleWhat can Ohio’s failed high-speed rail program teach us about America’s standing in the world?